Cooters Restaurant & Bar invites locals and visitors to Clearwater Beach to the 7th Annual Clearwater Beach Restaurant Week. Diners at Cooters will be able to enjoy a three course, pre-fix menu for dinner during Restaurant Week for just $28.99. In addition, Cooters will offer their full menu as well as their popular weekly specials. Cooters’ was awarded the "Chairman’s Award" at Restaurant Week 2010, Best Entree in 2013, The Chairman's Award in 2015 and numerous other awards over the past 6 year span. The culinary team looks forward to friendly competition at this year’s event. "We are proud to be a part of this exclusive list of Clearwater’s top local restaurants," said Owner Carol Mears. "This is the seventh year that we have participated in Clearwater Beach Restaurant Week, and each year just gets better than the last. We are looking forward to the opportunity to showcase some specialties during Restaurant Week. Stop in for a delicious dinner and a chance to win a fabulous prize!" 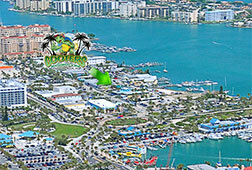 Note: Prizes will be awarded by the Clearwater Beach Chamber of Commerce. Eat, Vote, Win! Entry forms are available at participating restaurants. Welcome to Cooters Restaurant & Bar . . . the premier location on Clearwater Beach for Seafood, Steaks, and FUN! © 2004-2019 Cooters Restaurant & Bar All rights reserved.